In simple words, cloaking means covering or concealing something. In search engine optimization, cloaking happens when the search engine is presented with a different view of the website while the user is presented another view. Cloaking is a complete NO from the search engine’s side and webmasters practicing any form of cloaking are at a higher risk of getting their sites deindexed any time. 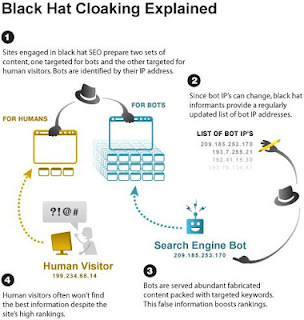 The moment search engine are able to detect cloaking, it deindexes the site from its database. Delivering content based on the ip of the user. Delivering content based on the User agent HTTP of the requesting user. Identifying any form of cloaking is simple. When you enter any search query, search engines displays a set of results. Under every result, there is a link to “cached”. You can click on the cached page to determine which version of the site is being displayed to the search engines. When you click on the main result link you will be directed to a different version of the page. You may also check cloaking with the help of Google toolbar. Visit the url of the site which you want to check. Now click on the cached link on the Google toolbar. If you see a different version of the site than what you were previously seeing, then it is an example of cloaking.